To be honest, I’m terrible at making time to do therapy with Benjamin. A quick stretch while I’m changing his nappy. A couple of rolls when we’re getting dressed in the morning. Plonk him in his chair facing in a slightly different direction each day, give him some toys to look at and that’s about it. To be honest, by the time I’ve done all the treatments that keep him alive – the inhalers and the nebulisers and the chest physio and n-p suctioning; by the time I’ve given him his medication six times a day and made up his feeds and checked his stoma and washed and dried all the syringes; by the time I’ve done the day-to-day essentials – washed him and dressed him, brushed his hair, changed his nappies, set up his sleep system, carried him from room to room, there doesn’t seem to be much time left for ‘therapies:’ the things that won’t keep him alive but will help him develop. The things that will stretch him, mentally and physically. They drop to the bottom of the list, somewhere between making sure everyone gets fed and catching up on the endless piles of paperwork that come with having a child with complex needs. 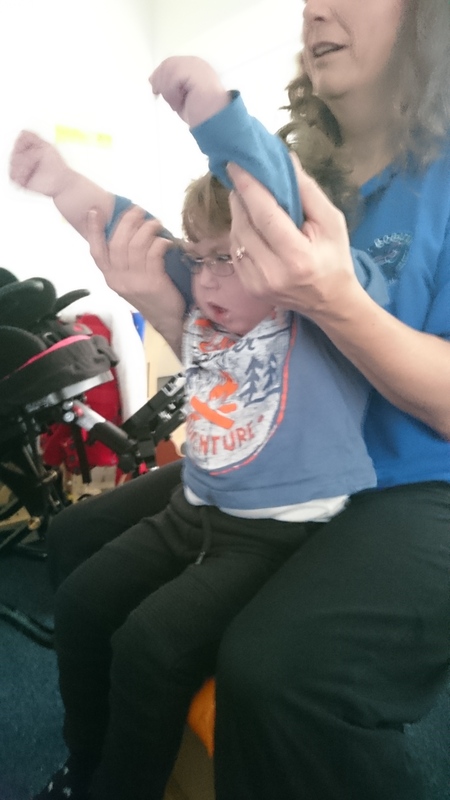 To be honest, putting him into shoes or splints or getting him onto a gym ball is quite hard work – he’s not getting any lighter or any more flexible. Getting him into his standing frame is really hard work. Sometimes even keeping him awake or finding a toy that grabs his attention is really, really hard. I’m scared of hurting his stoma, fearful of pulling out his feeding tube. I’m worried I might drop him! And I don’t want to push him – we’ve spent too much time in and out of hospital to want to push him. Too much time wondering if his seizures could be caused by overstimulation. Too much time fearing that rolling around on the floor during physio would make his reflux worse and therefore make his chest worse. Two days a week he goes to nursery, which is brilliant but exhausting for him: there’s no way he’d manage any exercises on top of that. 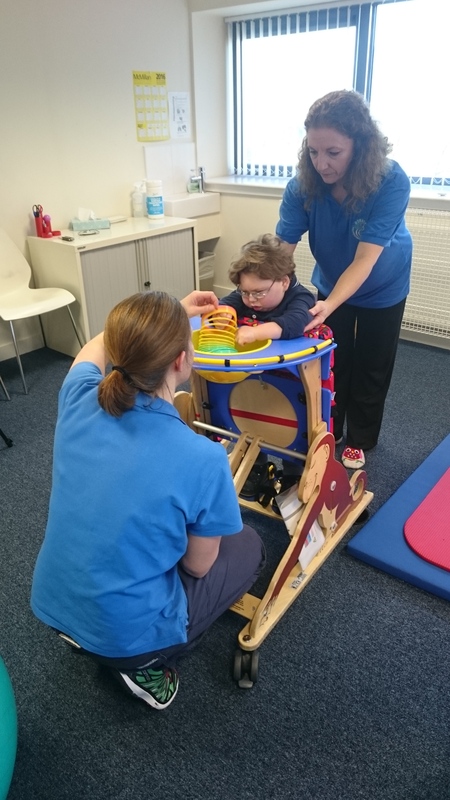 There’s usually at least one other day in the week he’ll have some kind of therapy anyway – a physio visit, or a session with the visiting teacher, and after 45 minutes’ intense interaction with them he’s shattered. Maybe he’ll be a bit off colour one day; another day he’ll have had a bad night and just need to sleep. And then it’s the weekend – surely he deserves a break on the weekend? Or is that just me? Because Benjamin is classed as ‘life-limited,’ I justify it by the reasoning Saira Shah, author of the Mouseproof Kitchen, calls upon when speaking about her daughter, Ailsa, before she passed away at the age of eight. “What’s the point of giving her therapy which would give her 20 per cent more muscle tone when she’s 50? This is what she loves … being held, being rocked, being dangled upside down. I don’t see why she can’t have a life where she is just cuddled.” But for us this has degenerated into a life where he just sits and watches me work. Our physiotherapist is wonderfully understanding. ‘Don’t see it as a therapy programme,’ she says, ‘you have enough on your plate. Just do it when you’re sitting with him anyway.’ But when am I ever ‘just sitting’ with him? When do I ever sit, alone or with my children? When do I stop rushing around and connect with any of them? And then, then there are the girls. They are both part of the problem and part of the solution. It is so hard to find time to focus upon Benjamin, who just sits there passively, dozing, when there are two caterwauling bundles of energy, one stout and curly, one lithe and blonde, pulling you in opposite directions with opposite vociferous demands. But, no thanks to my lax approach (and partly thanks to our sessions at the Bobath Centre), he’s getting good. He really is. He can look to both sides now – and hold it. He can sit straight and tall with only a minimum of support at his lower back. He can bring his head up with you from lying. He can hold his head up when you lean him sideways. I hadn’t really noticed until I was watching his physiotherapist working with him one day. It’s much easier to see when you’re watching from a distance. And suddenly I thought, hang on, I want some of that. It was like a switch flipped in my head. 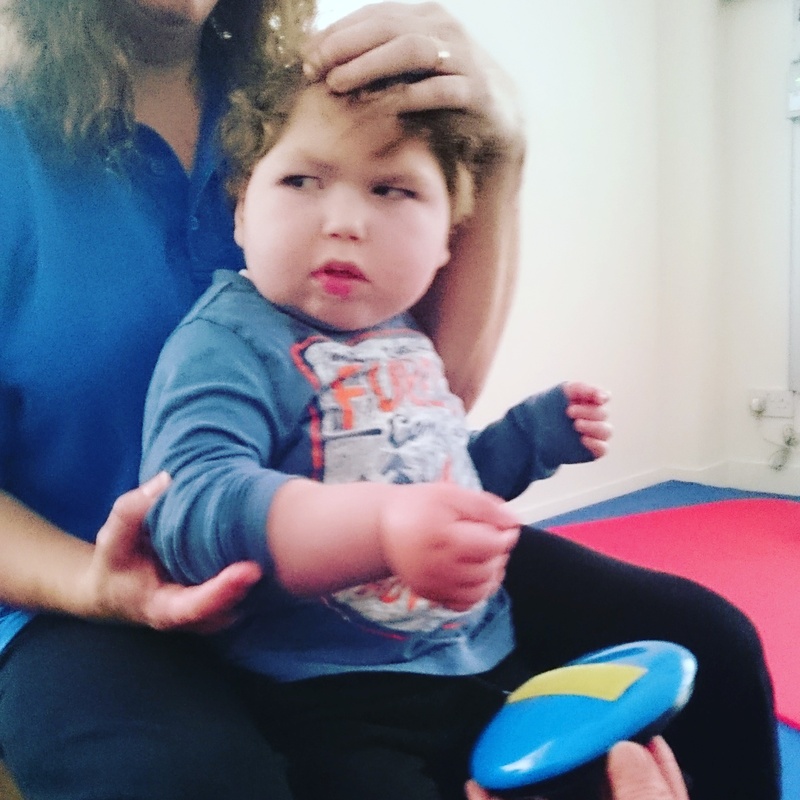 Doing Benjy’s therapy isn’t a chore, to be got through as quickly as possible, to be ticked off the list. Benjy’s therapy isn’t in conflict with enjoying him – it’s time to enjoy him, to let him show me what he can do. It’s precious time to spend with him, revelling in his achievements, building a better connection. Just as I spend time with Jackie reading stories before bed, or building Lego. Just as I spend time breastfeeding Caitlin and pushing her on the swings. I guess I’m starting to appreciate this a bit more now he’s getting older and I’m not necessarily with him 24/7. 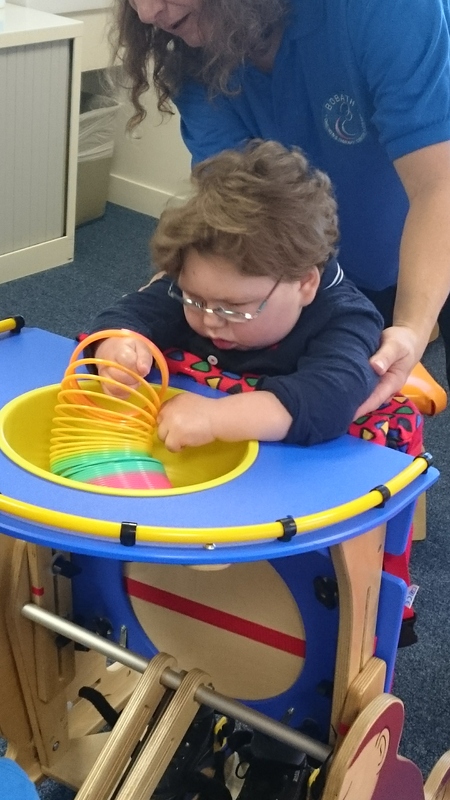 With his carers, nursery, respite, and time at Rachel House (not to mention time in hospital), we’re slowly dividing his care up between more and more people, which means less and less Benjy-time for me. I need to start claiming some of that time back in ways we will both enjoy and benefit from. And could it even help me to slow down a bit? Instead of rushing around the house could taking half an hour to ‘just sit’ with Benjy also be a half hour for me to breathe, relax and regroup? And could it actually be of benefit to his sisters too? Instead of leaving them in front of some uncensored crap on YouTubeCbeebies could we at least and watch Cbeebies together, in the same room, and talk about what we’re watching, while Benjy’s practising his moves? I could learn a lot from Benjy’s little sister, bouncing up and down on her tiptoes in front of his chair going ‘Jenjy – uh – uh – uh – Jenjy’ and demanding to have him lowered down to her height to play. Because that’s all his therapy is, really, play. It’s not arduous, it’s not unpleasant. It’s a bit of stretching out, a bit of rolling on a gym ball, a bit of singing nursery rhymes and doing the actions, a bit of looking at things he likes to look at. What am I making such a meal about? Why am I putting it off? Therapy isn’t in conflict with the cuddles, it’s a way to cuddle him more. We could all do with a few more cuddles in our lives – and Benjy-cuddles are the very best.